The university and Maynooth Students’ Union signed off on the first stage of construction. Students in NUI Maynooth are one step closer to having a student centre, after the college and Maynooth Students’ Union (MSU) signed off on the first stage of the report on the building. In an email statement to The University Times, MSU President Leon Diop confirmed that the signing of stage one was a “massive leap for the building”. “Now our focus is to drive the project on as quickly as possible and deliver a world class centre for students in Maynooth”, he said. “Like most projects”, Diop added, “the Student Centre was not without its difficulties. Discussions were had on who should occupy the building. The next hard decision was meeting the evolving needs of the students. We wanted to make sure the building was big enough to house everything students wanted and had enough space for the future student levels of Maynooth University”. The student centre forms part of NUI Maynooth’s campus development plan, which aims to meet the changing needs of staff and students. As the university is the fastest growing in Ireland, the new plan will see campus’ infrastructure improved. 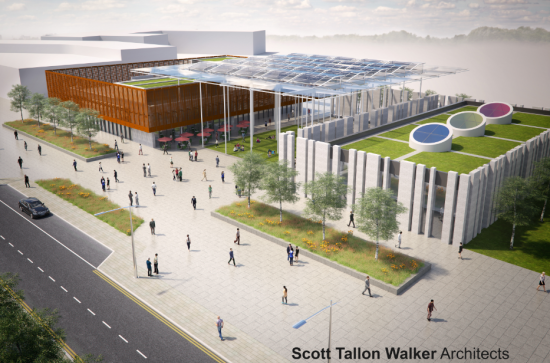 The student centre is set to open in 2021 and will be utilised as a base for the college’s clubs and societies, as well as the students’ union. Diop said “we are absolutely delighted to have come this far and we hope this good progress can continue for remainder of the project”. The centre is being designed by the same group who designed the library and several other buildings in NUI Maynooth. It will built with a focus on sustainability, and will include an outdoor living room under an environmentally friendly canopy. In March 2017, 88 per cent of Trinity students voted in favour of intruding a €30 levy to pay for the student centre. The construction of the student centre has been given a budget of €7 million and is due to be delivered within five years. Trinity is the only university in Ireland that does not have a purpose-built student centre.